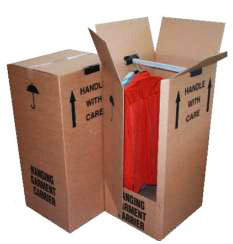 ﻿ Standard Size Wardrobe Boxes 20x18x38"
Home » Standard Size Wardrobe Boxes 20x18x38"
5 x Standard Large Size Double Wall Wardrobe Removal Boxes 20"x19"x38"
10 x Standard Large Size Double Wall Wardrobe Removal Boxes 20"x19"x38"
20 x Standard Large Size Double Wall Wardrobe Removal Boxes 20"x19"x38"
40 x Standard Large Size Double Wall Wardrobe Removal Boxes 20"x19"x38"
60 x Standard Large Size Double Wall Wardrobe Removal Boxes 20"x19"x38"
100 x Standard Large Size Double Wall Wardrobe Removal Boxes 20"x19"x38"
In this section you will find various pack sizes of standard size wardrobe cartons. The size of these cartons is 20x18x38" (508x457x960mm) and will fit most garments, but may cause very long dresses or very long coats to overhang at the bottom. We also stock an extra large size, specially for these extra long garments, also available on this site.